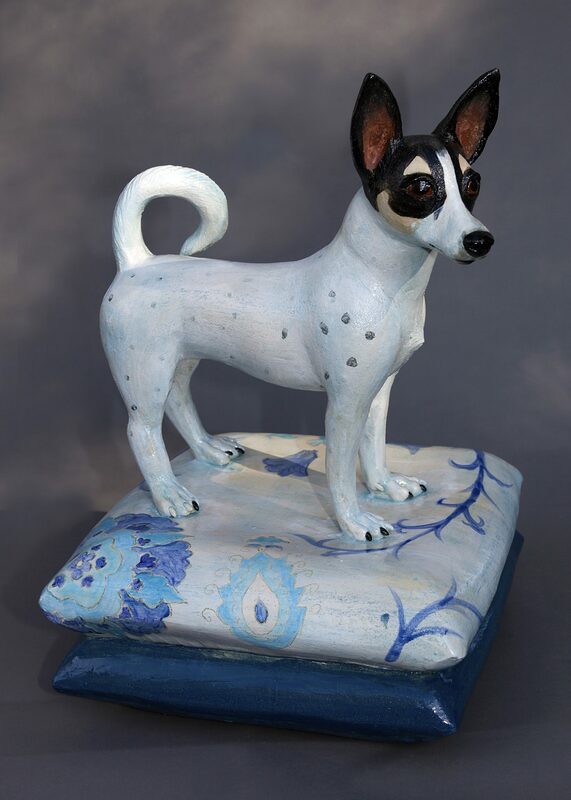 Rene Martucci Dog on Throw Pillows, 2016 Ceramic, 24" x 12" x 12"
René Martucci received a bachelor of arts degree from the University of California, Davis where she studied with Robert Arneson, Manual Neri and Wayne Thiebaud. Working under the tough and inspirational guidance of Robert Arneson, Martucci developed solid craftsmanship and a desire to explore and challenge herself as an artist. She sculpted at the ceramics lab TB-9 – noted for it’s influence on ceramic art. There, Martucci spent many hours sharing ideas with other talented students including Lisa Reinertson, Arthur Gonzalez and Tony Natsoulas. Martucci is a figurative artist, focusing on people and animals as her subject matter. Through her work Martucci seeks to represent thoughts, emotions, simple truths and states of mind. An abiding interest for Martucci is the retablo – a format stemming from her intrigue with her Italian heritage and from the Mexican culture in California – and a format allowing her to create intimate, autobiographical narratives. These stories address common, everyday scenes – walking the dog or watering the lawn–stories that are immediately accessible to the viewer. Much like Roy Deforest, Martucci has become know for her dog imagery. The two artists were featured together in an exhibit named “The Art of the Dog”, presented by the Sacramento Sutter club. It follows that Martucci’s notoriety for sculpting the dog results in numerous requests from collectors wanting their dog featured. Among these collectors are director Penny Marshall, Mary Robinson, the head curator at the Henry E. Huntington Library in San Marino, and Sara Kelly of the Kelly Broadcasting family. Also Intrigued by Martucci’s use of dog imagery, the UC Davis Vet school asked Martucci to design and create two dog sculptures for the Center for Companion Animal Health. One of the most exciting projects is Martucci’s work with renowned feminist artist Judy Chicago. Martucci sculpted eight cat portraits from Chicago’s book Kitty City: A Feline Book of Hours. The collaboration took place over a 6 month period during which time Chicago often came to work in Martucci’s Davis studio. Judy Chicago china painted the final sculptures. In October 2005, Martucci attended the unveiling at the prestigious Sculptural Objects and Functional Art exhibit in Chicago. Martucci has devoted over two decades to sculpting lifelike human and animal figures and has received wide attention for her work. One of the most enjoyable aspects of her works is their ability to be displayed indoors or outside. Among the many outdoor installations of her work, two of her sculptures stand at the entrance of the famous Staglin Vineyard and Winery in Napa winery noted for it’s fine art collection.